I am in love with Lauren and Matt's beautiful maternity session! Lauren and Matt are expecting their first child and they can not be more excited about the next chapter in their lives. Lauren looked simply stunning and the dress she chose to wear was a perfect compliment to her gorgeous baby bump. I am so honored to have been chosen by them to capture these memories with my camera. 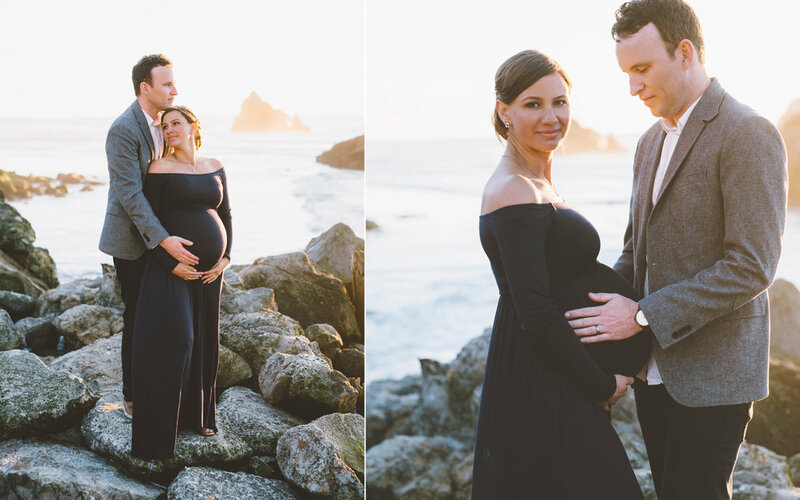 This maternity session was photographed at the Lands End and Sutro Baths in San Francisco. This location is one of my favorite Bay Area locations to photograph. We're so lucky to be in this gorgeous area! One of the main reasons for my love of the Lands End and Sutro Baths is because you get so much variety, all within walking distance. We started off in the forest area. This is above the Sutro Baths and then, we made our way through the ruins, then down to the beach. Because of its beauty, it is no surprise that on any given day there are large groups of photographers working with their clients. Whether it's a wedding, engagement, maternity or a family photo session- the expectation for this area is that it's going to be super busy. I was slightly worried going into it on a beautiful Saturday afternoon like this, but it all worked out. Lauren and Matt had a beautiful maternity session, regardless of how busy it was. It was a breath of fresh air to discover a sliver of deserted beach and that is where we finished off our session at the perfect time- as the sun went down. The hardest part about Lauren and Matt's maternity session was choosing these photos for this blog post. I could not narrow it down anymore so I am sharing a lot of them with you. Enjoy!